Apple has announced that six significant international airlines are installing iPod support in their aircraft from next year. The airlines are Air France, Continental, Delta, Emirates, KLM and United. On these airlines, seat connections will power iPods and provide a video feed to the LCD displays in front of the passengers. Oh oh! Until now, the iPod's dominance in the field of portable music has seemed challengeable. Maybe the Microsoft Zune could do it, given that company's muscle. But now? If the only support available for portable music players on international flights is for the iPod, and there are not yet enough of a single alternative interface to compete, then I see two likely outcomes, all of which depends on Apple's policies. The first is that Apple licences its proprietary docking interface to other manufacturers (perhaps it is already prepared to do this: I don't know but I'll ask). The other is that Apple's competitors will sue for the interface to be made available to them on basis of competition policy. I think a few of the suits against Microsoft may well act as precedents here. With regards to the eco system around iPod, companies can register with Apple to obtain a "Made for iPod" certification. This provides customers with the peace-of-mind that the individual product is in fact guaranteed to interface well with iPod. However, this is no requirement for companies to do this. Our dock interface incorporates both a hardware and software interface and it is proprietary. This is a key component of how the Apple experience is different to others in the market, as we do own all our own hardware, software and operating system.? As for competitors and what they will do, I will leave it up to them to comment on how they intend to drive their business. I think this means that Apple will not permit rival MP3 player manufacturers use its interface. When describing the differences between standard definition and high definition TV, I generally say that the higher resolution doesn't so much deliver more detail, but that the detail that is there is cleaner and more nicely defined. While that may be generally true, there are occasions when HD can deliver detail that is simply absent, or quite muted in SD. I noticed this last night when watching the fairly disappointing TV show, Jericho. Near the start there was a shot of a map. The texture of the map was beautifully defined when watching this scene on HDTV, even using a 720p projector. So I checked with an SD recording I had made at the same time, and there was some texture, but it was sporadic and only hinted at. So here are screen shots to illustrate the difference. The top picture is the whole frame, shrunk down to 300 pixels wide. The middle picture is a 300 by 300 pixel detail of the HD image, while the bottom picture is from the SD image. I scaled up the 1,024 by 576 pixel screen capture of the SD image to 1,920 by 1,080 pixels, so the size would be the same, then grabbed the same 300 by 300 pixel detail. I don't really need to comment on the difference, do I? The HD video was recorded on the new Strong SRT 5490 HD PVR, while the SD video was recorded on the new Topfield TF6000PVRt. I tranferred both via network connections to my computer and grabbed the screen shots using VideoReDo. The HD was broadcast at a resolution of 1,440 by 1,080 pixels, while the SD version was at 720 by 576 pixels (VideoReDo rescales the horizontal size for the correct aspect ratio when you're doing screen shots). Both were interlaced. The total bitrates were, respectively, 12.94Mbps and 6.07Mbps. The audio in the HD version was two channel Dolby Digital at 384kbps, while the audio in the SD version was two channel MPEG at 256kbps. The uncompressed file sizes of the two screen shots, in TIF format, were 7.91MB for the HD version and 1.69 for the SD, yielding a ratio of 4.68:1. Using the actual broadcast resolution, the ratio is 3.75:1. There was one downside to the HD broadcast. There was some conversation between two characters while they were driving along in the countryside. On the HD broadcast, this looked quite artificial because of the high resolution. The characters seemed pasted onto the background. This was far less apparent in the SD version. Clearly HD TV is going to force TV show producers to up the technical ante when it comes to green screen work. Sony Pictures Entertainment has supplied me with half a dozen Blu-ray titles that are to be released in Australia. Here's the big surprise: all of them are 60 hertz titles! I shall try to find out whether that is their continuing plan, or whether it is temporary, and what the other suppliers are proposing. The good point about titles being 60 hertz is that eliminates the 4% PAL* speed up (and associated pitch increase). The bad point is that the first two Blu-ray players on the Australian market will not do 24p output, so the best picture quality is 60p. That makes for jerky pans and the like. Still, eventually all Blu-ray players will offer 24p output. * I have been chastised for misusing 'PAL'. Technically PAL is a description of the colour encoding system used in places like Australia, Germany and India, and has nothing to do with resolution and frame rate. Indeed, some South American countries use PAL colour on an NTSC-like 480/60i resolution signal. Nevertheless, I shall continue to use PAL from time to time as shorthand for 576/50i signals. It is just too convenient not to use. I went to Sydney today for the Panasonic's 2006 product launch (at Panasonic's expense). They whetted my appetite by an invitation to a small group briefing, after the main event, on Panasonic's Blu-ray strategy (I think there were about half a dozen of us there). Unfortunately I had to bail before exploring all the issues I would have liked to, or I would have missed my flight back home. There were three really, really exciting things at the launch, and I'll get to these in a minute. First, on a more mundane level, Panasonic is releasing a new series of high resolution (ie. 720p or thereabouts) LCD and plasma TVs. It is also releasing a new, upgraded, version of its highly regarded PT-AE900 projector. The new one is called the PT-AX100 (I guess they ran out of numbers for the AE tag). Still 1,280 by 720 pixels, it mostly had detail changes. The case is no longer silver, so it looks less like a business projector. And the ANSI rating is up to 2,000. Most impressively, the RRP has fallen to $3,299. Available in October. First, Panasonic is also launching next month two new DVD recorders. The DMR-EX75 and the DMR-EX85 will, respectively, have 160 and 250GB hard disk drives. What's special is that these will also have integrated digital TV tuners, and HDMI output. I wish I could tell you more, but I was so interested in the other stuff that I didn't notice this last detail about them until just now, as I was looking at the press release. I'll get ahold of one next month to review. Prices: $879 and $1,099 respectively. 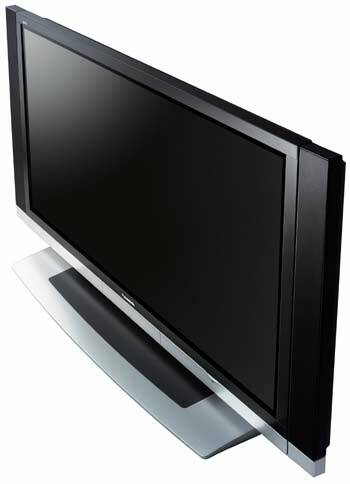 Panasonic is also launching next month a new plasma display. So? How about 65 inches and full 1080p resolution? The TH-65PV600 looked very nice at the launch with a Blu-ray demo disk being run. Contrast ratio is said to be 5,000:1. It apparently has a tuner built in, but seemingly only analogue which is a bit strange. Input signal standards via HDMI include 1080/50i, 1080/60i, 1080/50p and 1080/60p, but apparently not 1080/24p. That's a problem, as I'll get to in a moment. Oh, the price? $17,499. That might jolt Pioneer a little, as its new 50 inch 1080p plasma display is $14,999. What else was there? Oh, that's right. How about a full 1080p front projector? The PT-AE1000 is an LCD unit offering 1,920 by 1,080 pixels. They had this up and running, and unlike the Fujitsu high definition LCD projector, no screen door effect was evident, even poking my nose up to the screen. According to its spec sheet, this one will support the same input video standards as the 65 inch plasma, but adds 1080/24p. That's good news, as I'll also get to in a moment. Price is not stated yet, and the release date will be November. I'd be surprised if the selling price is over $10,000, but I'm trying to extract some kind of approximate price from Panasonic. Finally, there was the DMP-BD10, Panasonic's Blu-ray player, destined for release in October as well. I don't think much of the styling, but who cares? It's Blu-ray! True HD movies of your choice! Well, not really, for a while anyway. 20th Century Fox was at the launch in the form of Fox's Roy Cannall, the Senior Vice President for Global Business and Technology. Several releases will being appearing in November. Can't say I think too much of the titles chosen: initially Fantastic 4 and a few others. Soon after will see Kingdom of Heaven in a >3 hour director's cut, on a dual layer (ie. 50GB) disc with 5.1 channel lossless audio. Also there will be Ice Age 2, with 24 bit lossless audio. The DMP-BD10 will not initially support the DTS HD or Dolby Digital True HD audio standards, but a firmware upgrade is expected to be available fairly soon to provide that support. Price: $2,749. But there could be a problem with all this. The Blu-ray demo stuff they had on (primarily clips from Kingdom of Heaven and Ice Age 2) was absolutely awe-inspiring, in its detail, depth, and colour discrimination, both through the 65 inch plasma and the HD LCD projector. But there was one major problem with the picture on both display devices: the pans were jerky. It took thirty seconds for the penny to drop with yours truly: the Blu-ray player was delivering the video as 1080/60p. But the films were shot at 24 frames per second. How to convert 24 frames per second to 60? Let us say that the first six film frames are labelled A, B, C, D, E and F. This is how they are delivered at 60p: AAABBCCCDDEEEFF. That is, a frame is shown three times, the next frame twice, the third frame three times, the fourth twice, and so on. On a little glass tube TV, you would probably not, or barely, notice this. But blow the picture up to a 65 inch plasma, or even more so to a 120-ish inch projection screen, combine it with the incredible sharpness offered by 1080, and the jerkiness is bleeding obvious and most offputting. That's the weakness of the DMP-BD10. It offers all the usual output options, plus 1080/50p and 1080/60p, but not 1080/24p. I expect once it starts getting reviewed in the US it will attract adverse comment on this. With 24p output, there are no cadence problems. But will that be a problem for us? It all depends on whether Australian Blu-ray movies are released in 60 or 50 hertz versions. That's one question I didn't get a chance to ask, having to catch a plane. Incidentally, don't expect to import US DVDs. We will be Region B, along with Africa and Europe. The Americas and Japan will be Region A. Asia, including Russia, will be Region C. Expect the region protection scheme to be fairly robust, at least for a while. There was another interesting product at the Sony Experience expo: the Sony RDRHX760 DVD recorder. So what? This one has a built in standard definition digital TV tuner. About time! Compared to the forthcoming Philips DVDR9000H it has some advantages and disadvantages. For the latter, mark down the (still more than adequate) 160GB versus the Philips' 400GB, and the lack of a HDMI output. But in its favour, at $999 it will have an RRP of just half that of the Philips. In fact, that's a pretty reasonable price, putting it at $100 more than Sony's current 160GB DVD recorder, which has an analogue tuner. I had bit of a fiddle with it and generally it is pretty easy to use. But not all is perfect. For one thing, when you record something it is transcoded to one of the fixed Sony quality settings (1, 1.5, 2, 2.5, 3, 4, 6 and 8 hours - I don't recall the HQ+ hard disk drive high bit rate mode being there, so maybe, like Pioneer, Sony has dropped it. I can only imagine the millions of calls they get from people who have used this mode on hard disk recording, and then found they couldn't copy it at high speed to a DVD-R). That means that quality advantages of having an inbuilt digital TV tuner, rather than having to sent it in via an analogue connection from an external tuner, are reduced somewhat. I do wish it had an 'original bitrate' mode, so that your recordings could be identical quality to what was broadcast. There is also a 'live pause' capability. But this is horribly clunky. Once you invoke it, you can't go back to live TV for something like a minute. There was talk of a buffer needing to be filled, but that doesn't make much sense to me for no one else with a live pause option has this problem. Still, this is Sony's first bash at this and those issues are probably well worth living with simply because of the excellent price. Samsung has just announced that it will be releasing its first Blu-ray player, the BD-P1000, 'early in Q4' this year. That would suggest sometime in October. Might make a nice match with the Sony projector mentioned below. Samsung says it has twin lasers in the same head so that it will also read CDs and the various DVD formats. It also says it will do 1080p output, and provide upscaling of DVDs to the same resolution. A few weeks ago I went looking for a ten metre HDMI cable so it would fit nicely with my bundle of analogue video cables. Until then I had been using a five metre cable that barely stretched from receiver to projector. But there was a problem with my search. The only ten metre HDMI cable I could find in Canberra was a Belkin PureAV cable. The marked price? How about $500+! Fortunately, a few weeks before I'd read about an Australian company in one of the magazines for which I write (Connected Home Solutions, a trade magazine not generally available in newsagencies). That company was Kordz, which specialises in HDMI cables (plus it has quite a range of quality analogue cables). So I lodged an order with a company called HT Custom Cables for the cheaper version of the ten metre Kordz HDMI cable. Cost? $159! The silver 'Diamond' version costs over $200. Some good news, we are out of stock of the Krystal 10m HDMI cable you ordered, new stock isn�t available from the supplier for 2-3 weeks. So we have given you a free upgrade to the silver plated Diamond cable, enjoy. Now, that's pretty good service. A couple of days later I had the cable. It works perfectly. Incidentally, I was at the CEDIA Expo at the Gold Coast over the weekend (thanks to Panasonic for taking me there, as well as to the second match of the Bledisloe Cup). 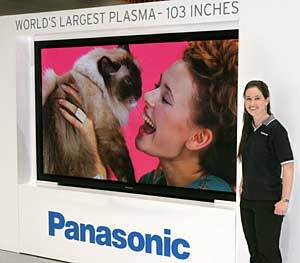 Panasonic was showing off several things, including its monster 103 inch (2.61 metre) 1080p plasma display. Pretty good display and bigger than lots of front projector screens. But how do you get it into a home? It also was demonstrating its new control features between an LCD TV and the DMR-E65 DVD recorder, which uses the HDMI connection to allow control of one device by another. I took a peek and the cables used were Kordz. Is there any point in making sure that the HDMI cables you purchase are properly certified? Who knows? But it may be a while before problems with some substandard cables are disclosed. HDMI can carry video up to 1080p, which may well demand greater bandwidths than 1080i that all current HDMI cables can carry (depending on the frame rate used). Remember, the video is full decompressed digital, so if you double the picture resolution, you double the data demands on the cable. So be careful. A cheap cable may well work beautifully even for 1080i, but may not work for 1080p. So I'm reviewing mid-priced ($AUS2,000 to $4,000) home theatre receivers at the moment. Most of them are equipped with HDMI switching. I've been using one of them for a couple of weeks, with a HDMI DVD player plugged in along with Sony's new high definition personal video recorder. The display is an InFocus IN76 projector, a rather nice little unit. It's time to switch from the receiver I've been using to another one, from Brand A. (You'll have to read the review in Sound and Image to find out the brand). I then spend a couple of hours trying to make it work. The HDMI doesn't work at all in the audio and video departments. The analogue video is flaky as anything with 'Video Convert' switched on, and whenever I switch the on screen menu display mode from NTSC to PAL, the picture goes haywire with the projector thinking it's still in NTSC format, and therefore losing lock. So I whinge to Brand A and they agree to send a replacement, since the former one had obviously been carted all over the place from the wear and tear on the box. While I'm waiting, I wire up the next receiver in the queue, Brand B. Well, blow me down, but Brand B won't do video at all! Neither analogue nor digital. Even the on screen display won't work. And since the front panel display is totally uninformative during menu operations, I can't even set up the audio side. About this time doubt sets in. Brands A and B are highly reputable. They ought to work. Have I crapped something up in my system? Still, I whinged to Brand B and they promised to send a new one out to replace the 'broken' one. Meanwhile, the replacement from Brand A turns up, so I unwire Brand B, wire in Brand A (by this time I'm developing mighty muscles in my fingers from tightening speaker terminals). Blow me down again, it exhibits an identical set of problems to the first unit. By now my confidence is totally shaken. The new Brand A unit is obviously new, with the foam wrapping clearly not having been touched since it left the factory. It's almost unthinkable that this brand would screw up this badly. I hit the Web and the only forum references I could find to this model were that all was hunky dory, although there was an implication that others (who I couldn't find) may have suffered from 'glitches'. So it was time to eliminate alternative sources of the problem. First, plug the DVD player via HDMI directly into the projector. The video worked fine. Okay, so I know the cable is working and the source is compatible with the display. So I decided to go for a total Brand A solution. I had to hand a Brand A source with HDMI output. I plugged this into the Brand A receiver. I also had to hand a Brand A projector with HDMI input. I plugged the receiver's output into its input. Guess what? Still no HDMI picture or sound whatsoever. That exhausted possibilities for that day (or, rather, evening since by then it was about 11pm). First thing the next morning the replacement Brand B receiver turned up. I looked at its carton from time to time over the next couple of hours, procrastinating, reluctant to find out for sure if I'd made a complete fool of myself in my complaints to Brands A and B. Then Brand C turned up as well. I was very tempted to go straight for that, but in the end decided to try the new Brand B receiver. That would be the real test. I was already starting to mentally compose apologetic emails to the suppliers. Oh, what glorious relief! The new Brand B receiver worked perfectly. All video conversions worked as they should, HDMI video and audio worked as it should. I wasn't insane. It was just an awful coincidence. Brand A is distributing a dreadful product of which it should be ashamed. Brand B had a spot of bad luck with having delivered a broken receiver. But with three bad receivers in a row, I had been starting to think that it was me or my setup that was the problem. UPDATE (Tuesday, 15 August 2006, 12:14 pm): Guess what? Brand A is not entirely to blame. I switched to a SIM2 Grand Cinema C3X projector which had turned up for review (beautiful unit incidentally) and Brand A worked perfectly. There are some wobbles, clearly, with the InFocus IN76 projector. But Brand A is not entirely blame free either, because the other receivers worked fine with the InFocus.